The lengthy subtitle says this book looks not only at the town but also at the surrounding area. 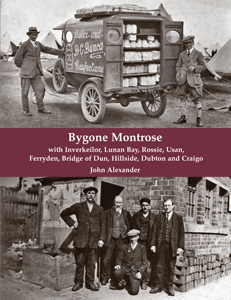 Using the cream of a locally-held collection of old photographs, supplemented with some never before published material from another private collection, the author has spent many hours researching to write informative captions that tell the story of Montrose and the surrounding settlements. Amongst the gems included are interior photos of Craigo Mill and the Montrose Royal Asylum at Sunnyside. Railways, flying, footie, golf, bathing and bowls, the bridges and everyday life are just some of the subjects covered in this wide-ranging book.